A Fresh Look at "Fine Art"
This is a revised version of a talk given at the annual meeting of the National Art Education Association, in Boston, Massachusetts, on March 4, 2005. It has been reprinted, with the addition of source notes, in the May/June 2006 issue of Arts Education Policy Review. In January, trash collectors in Frankfurt, Germany, hauled away what appeared to be a heap of abandoned building materials they had found on a city street. When the head of sanitation later read in the newspaper about an exhibition of public sculpture in progress, he realized that the heap removed by his men, and subsequently incinerated, was intended to be a work of art. "I didn't recognize it as art," he said, as reported in the London Guardian. Thirty of the city's sanitation workers were subsequently sent to "modern art" classes to learn to avoid such mistakes in the future. Closer to home, in Allentown, Pennsylvania, a rundown building was recently slated for demolition as part of the city's redevelopment program. When the head of that program was asked what he planned to do with the art on the side of the building, he replied, in effect, What art? Although he had often walked by it, he had never noticed a work of art there. After being informed of its existence, he remarked: "It just looks like a metal grid. I thought it was some kind of condensation pipes." According to authorities consulted in the matter, however--individuals ranging from the director of the Smithsonian Institution's "Save Outdoor Sculpture!" program to a professor of sculpture at Temple University--the piece (an arrangement of thirty-five galvanized steel bars) is not only a work of art but an important one, by "one of the top public sculpture artists" of the time, as one expert put it. Yet ordinary people like the Frankfurt trash collectors and the city official in Allentown--indeed a good many of the general public--still adhere to a traditional view of what art is. Are they simply behind the times and in need of re-education, as the unfortunate Frankfurt trash collectors were judged to be? Or might the traditional concept of art be worth preserving? And is it perhaps the presumed experts who should re-think their basic premises? Those are some of the questions I aim to shed light on here. When I refer to a "traditional" view of art in the present context, I mean what was originally termed fine art. In its broad sense, that term included all the "mimetic" (or "imitative") arts--that is, music and dance, poetry, drama, and fiction, as well as painting and sculpture. In the narrower sense most relevant to the field of art education, however, the term has been used to refer to the purely visual arts of painting and sculpture. When most ordinary people think of visual "art," what generally comes to mind for them, therefore, are traditional (i.e., representational) works of painting and sculpture. They are more likely to think of Rembrandt, van Gogh, or Michelangelo, for example, than of Mondrian, Mark Rothko, or Jackson Pollock. And they surely do not think of such postmodernist inventions as "installation art" "performance art," "video art," "conceptual art," and "earth art." But why, one may well ask, do so many fail to regard these twentieth-century inventions as art? Some observers might say that it is merely out of resistance to anything new. I don't think so. Abstract work, for example, is scarcely new. It has been around for nearly a century. Yet many people, even fairly sophisticated art lovers, still have strong reservations about it--as was well documented more than a decade ago by David Halle's informative sociological study Inside Culture: Art and Class in the American Home. In my view, a more logical answer to why so many people do not consider the new inventions to be art is this: they sense that they differ fundamentally from the things that were originally called art--i.e., from traditional painting and sculpture. And to call them "art," as the artworld does, implies that they are similar. Some members of the public are willing to grant that antitraditional contemporary work is "art," yet find it meaningless, unintelligible, or simply worthless. The artworld responds that the problem lies not in the work itself but in the public's ignorance. In order to comprehend and appreciate such work, it is claimed, one must be well versed in art history and theory. Such an argument surely confirms the truth of Tom Wolfe's thesis in The Painted Word: works of art have been increasingly displaced in importance in recent decades by theoretical justifications--by the "incessant verbalizing" about art, to quote cultural historian Jacques Barzun. No theory merits acceptance, however, without a rational assessment of its underlying premises and practical results. Louis Torres and I offered such an assessment of both modernist and postmodernist theory and practice in Part II of What Art Is. What follows below is a summary of key points of that discussion, as well as an outline of basic principles of the alternative view presented in the book. Let me emphasize that while this alternative view is based most directly on Ayn Rand's esthetic theory, it is compatible with ideas about the essential nature of art held by thinkers ranging from Aristotle to Zen philosophers to members of African tribal cultures--as we documented throughout the book. It may therefore be regarded as a universal theory of art, transcending cultural diversity. 1. What is the relationship between art and life? 2. What is the role of subject matter and content vs. form and style in a work of visual art? 3. What part does emotion play in the creation of, and response to, a work of art? 4. What is the nature of the artist's role in the creative process? The most important of these questions--closely connected to the other three--is, What is the relationship between art and life--between works of art and reality itself? For most of human existence, in every known culture since the dawn of mankind, a meaningful relationship between art and life was clearly discernible. Since time immemorial, humans have created images, whether in two- or three- dimensional form, representing the animal kingdom, their fellow men and themselves, the world they inhabit, and the divine realm conceived in their imagination. Such painted and sculptured forms resembled, in some measure, things in the real world, and were intelligible in terms of human knowledge of such things. 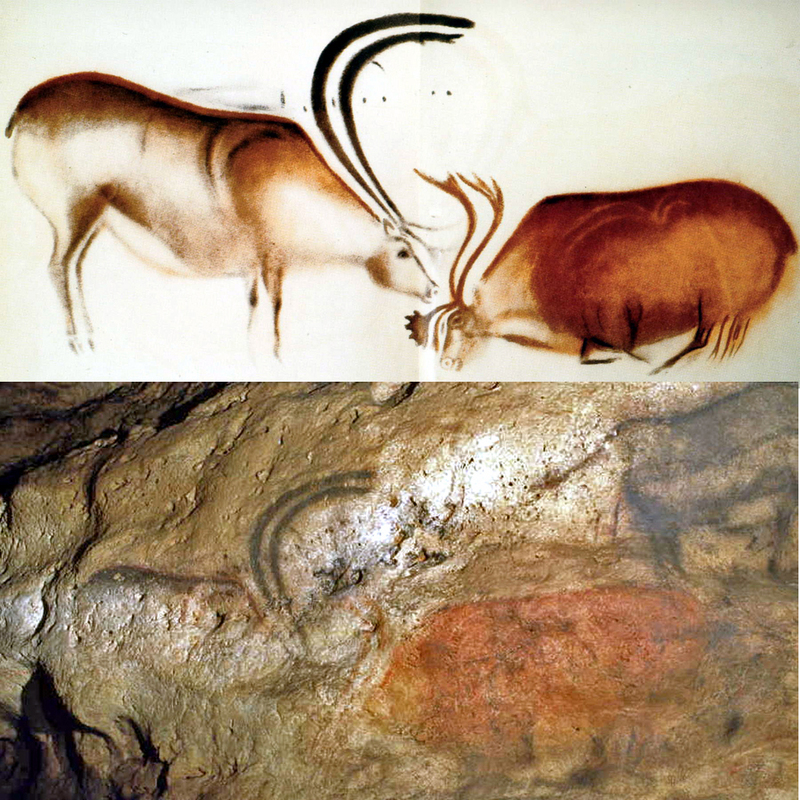 Consider, for example, the prehistoric image of Two Reindeer from the Font-de-Gaume cave in France. A male deer is represented as if nuzzling the head of a female depicted lying on her side, perhaps wounded, ill, or about to give birth. What was the meaning or purpose of such an image? It has often been suggested that prehistoric cave paintings were intended solely for magic efficacy, to ensure success in the hunt or that some other physical need would be met. The subtle rendering of tender feeling apparent here, however, goes far beyond the perfunctory, schematic character of representations employed in modern-day cultures for purposes of ritual magic. Voodoo figures, for example, are typically crudely fashioned. We can never know for certain, of course, what purpose motivated the prehistoric man who painted the Font-de-Gaume image, but we may reasonably infer from the qualities embodied in it that he felt some empathy for the fellow creatures on whom he depended for his sustenance. In taking the considerable trouble to create this visual representation, he was probably satisfying another sort of need--not a physical but a purely psychological one--the need to objectify his thoughts and feelings in concrete form. As the writer Robert Payne suggested in The World of Art, prehistoric artists must have filled the walls of their caves with the images of such animals "because their minds were filled with them." As indicated by the Images of Exemplary Works of Art accompanying my article "Rescuing Art from Visual Culture Studies," the long tradition of representational painting and sculpture has encompassed a wide range of styles and an infinite variety of subject matter, yet certain subjects have recurred from era to era and culture to culture--no doubt because they represent things that have always been of human interest. Such images provide a context in which to assess modernism's radical break with the past. In a dramatic departure from millennia of art-making, modernists such as Kandinsky, Malevich, and Mondrian in the early years of the twentieth century entirely abandoned representation, not only of living things but of recognizable objects in general. Even more remarkable than that salient fact of art history are the premises and intentions that moved them to do so. The relationship between art and life. First and foremost, the pioneers of abstract painting believed that works of art pertain to a realm completely detached from, and superior to, life. Reacting against cultural materialism, these first abstract painters sought to reflect what they imagined to be a higher plane of reality by creating work in which no recognizable objects at all were represented, only abstract forms. Through abstract shapes, color, and line, they attempted to represent a realm of pure spirit, "untainted" by material reality. But they were profoundly mistaken--even deluded--in thinking that such a goal was desirable, much less attainable, given the nature of human perception and cognition. For one thing, it is impossible to guess the modernists' lofty intention just by looking at their work. We know it only from their extensive theoretical writing, and from that of like-minded critics. To the ordinary viewer, one of Mondrian's typical grid-like "Compositions," for example, conveys no meaning, exalted or banal. It simply looks like an interesting pattern, and as such it has inspired design motifs for fabrics and various decorative products, from floor covering to high-fashion clothing. Nonetheless, Mondrian insisted that only through the "annihilation" of objective reality could art express the higher consciousness toward which he believed humanity was evolving. Modernists who were not mystically inspired also severed the objective connection between art and life. The influential British critic Clive Bell, for instance, argued that art possesses "an intense and peculiar significance of its own . . . unrelated to the significance of life." In his view, "To appreciate a work of art we need bring with us nothing from life, no knowledge of its ideas and affairs, no familiarity with its emotions." At the same time, modernists held that the understanding and appreciation of art involves a special aesthetic faculty, or sensibility, that is not possessed by all people and that is quite distinct from our everyday faculties of perception. Influenced by occult philosophy, the first abstract painters actually believed that they possessed a more highly evolved form of consciousness--which was, they claimed, "beyond reason," and which conferred (in the view of Malevich and other Russian "Cubo-Futurists") not merely clairvoyance but even the ability to see through solid objects. 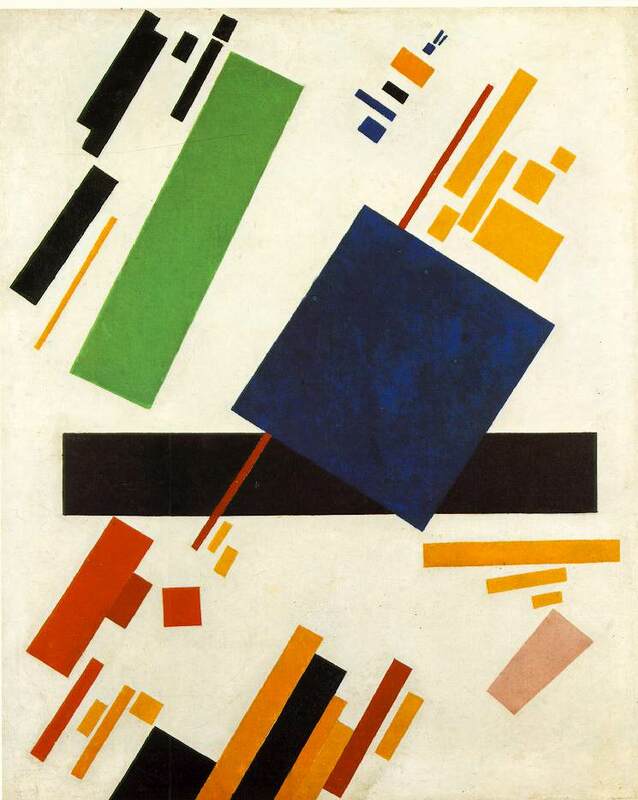 If you did not understand one of Malevich's Suprematist paintings, therefore, it was simply a sign that your consciousness had not yet evolved to this higher plane. Later in the century, the pre-eminent modernist critic Clement Greenberg ignored such metaphysical claims. But his approach was equally divorced from any meaningful connection to life experience. Explaining different responses to art as simply a matter of intuitive judgments by "people with good eyes" vs. people with "bad eyes," he saw no relationship at all between aesthetic judgment and the exercise of one's visual faculty in real life. If you could not see why Jackson Pollock's drip paintings (such as Cathedral or Number One, 1948, both of which were praised by Greenberg) should justify the superlatives the critic heaped upon the painter--including the claim that Pollock was "one of the major painters of our time"--you could be sure you'd be counted among the "philistines," the ultimate term of cultural opprobrium employed by Greenberg and other modernists. No doubt you'd be similarly labeled if you failed to discern in what respect the series of abstract Elegies to the Spanish Republic by Pollock's fellow Abstract Expressionist Robert Motherwell constitute a "majestic commemoration of human suffering" that is expressive of "the inexorable cycle of life and death" (to quote the Guggenheim Museum's website). Motherwell, by the way, painted some two hundred variations on this theme. Form/style vs. subject matter/content. On the second theoretical question, regarding the relationship between form and style, on one hand, and subject matter or content, on the other, I have already noted that the modernists deliberately abandoned recognizable subject matter in favor of abstract forms. In Mondrian's emphatic terms, all subject matter "must be banished from art," because the representation of physical objects "is fatal to pure art." Though neither he nor the other early abstract painters aimed to abandon meaning in their work, their occult premises led them sadly astray. By abandoning the representation of recognizable objects, they rendered their work incomprehensible to the poor viewer who had not yet evolved "beyond reason." Later modernists such as Clement Greenberg and his critical disciples ignored the spiritual aims of the artists who had invented abstract painting, however, tending instead to discuss it in purely formalist terms. According to Greenberg, both subject matter and content had become "something to be avoided like a plague" in this "advanced art," as he pretentiously dubbed it. As a result, the artistic breakthroughs he acclaimed in abstract painting generally consisted of the emergence of various "signature styles"--from the drips of Jackson Pollock to the "zips" (or stripes) of another Abstract Expressionist, Barnett Newman. The role of emotion. What about the modernist answer to the third key question of art theory, regarding the role of emotion in art? For modernists, emotion was of prime importance in art, but they viewed it as a direct, unmediated response, divorced from ideas and values related to life. Malevich, for example, wrote: "[A] blissful sense of liberating non-objectivity drew me forth into the 'desert' [of black squares on a white background], where nothing is real except feeling . . . and so feeling became the substance of my life." Similarly, a half century later, Robert Motherwell declared: "The emergence of abstract art is one sign that there are still men able to assert feeling in the world. [I. e.,] Men who know how to respect and follow their inner feelings, no matter how irrational or absurd they may first appear. . . . Abstract art is an attempt to close the void that modern men feel." Yet without the benefit of such an explanation no viewer could guess the feelings that Motherwell attempted to embody in one of his Spanish elegies, for example. And even with the benefit of his explanation, it seems unlikely that anyone would actually experience such feelings. The role of the artist. As for the modernist view of the artist's creative role, it was equally ineffable. The artist was seen as an inspired visionary, a genius whose intentions, however unfathomable to ordinary mortals, are nonetheless worthy of the struggle to comprehend them. 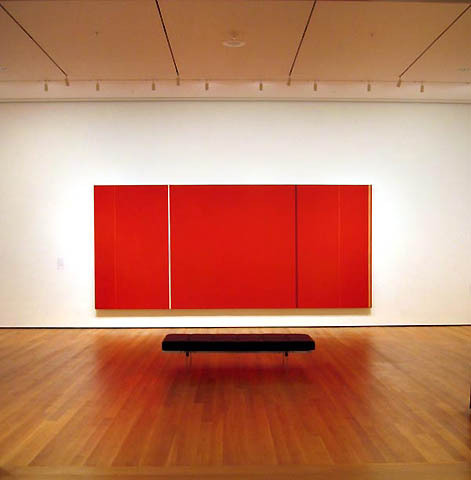 Greenberg praised works such as Barnett Newman's Vir Heroicus Sublimis not only for their simplicity (they surely have that) but for their "transcendent" capacity--a claim that represented a lapse from Greenberg's customary formalist emphasis. Newman's pretentious Latin title for the painting means "heroic sublime man." Without benefit of the title, however, who would have any idea what this work is intended to mean? To the museum guard who spent much of his working life in the presence of it, in fact, Newman's painting looked like nothing more than "a blank wall with stripes." Most ordinary people would agree. For such viewers, Michelangelo's David or his Moses would be far more likely to qualify as a transcendent image suggesting "heroic sublime man." Postmodernism in the arts began as an extreme reaction against modernism--in particular, against the dominance of Abstract Expressionism in the artworld. On virtually every point of theory and practice, therefore, postmodernists adopted a diametrically opposite approach. In fact, the primary impetus for the bizarre forms they invented was their wish to challenge the status of modernist work, not an earnest desire to create something of value in itself. The relationship between art and life. On the key question of the relationship between art and life, as I observed earlier, modernists held art to be a supreme value in its own right, without objective reference to human life. Postmodernists therefore began by treating art as if it had no distinctive nature or value at all. In its most extreme form, this attitude was expressed in the explicit aim of blurring the very distinction between art and life. The prominent postmodernist Robert Rauschenberg declared, for example, that painting "relates to both art and life" and that he tries to act "in the gap between the two." What on earth does that mean? And should something purportedly in the gap between art and life (such as his "mixed media" piece, Bed [enlarged]--which is neither painting nor sculpture, consisting instead of an old quilt, sheet, and pillow affixed to a frame, with paint slathered over them--therefore be considered as something quite different from art? Another major early postmodernist, Allan Kaprow, even wrote Essays on the Blurring of Art and Life. Kaprow was the inventor of "Happenings"--kookily staged events involving spectators in a series of arbitrary and incoherent actions, which were the precursors for such postmodernist genres as "installation art" and "performance art." He advocated creating work "as open and fluid as . . . everyday experience." Tellingly, he admitted that he was "not so sure" whether such work was "art or something not quite art." Of course, it was not art. Nonetheless, it was soon fully accepted as such by the arts establishment, which now treats its successors on a par with traditional painting and sculpture. Form/style vs. subject matter/content. The postmodernists' blurring of the distinction between art and life has inevitably affected their attitude toward the relationship between subject matter and content, on one hand, and form and style, on the other. Recall that modernist theory and practice greatly inflated the significance of formal properties and style, at the expense of discernible subject matter. Not surprisingly, the postmodernist reaction was to dismiss formal properties and style as having no significance at all. Occasionally, their work actually makes ironic reference to this issue. Rauschenberg's slathering of paint on Bed, for example, was an irreverent parody of much Abstract Expressionist painting. Typically, however, postmodernist work is deliberately impersonal and mechanical in execution, removing all traces of the artist's hand or personal style. 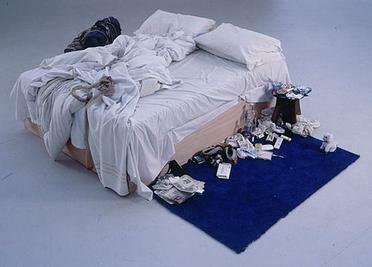 Postmodernists either appropriate existing images (photographs, advertisements, or previous art works) or use everyday objects, simply arranging them in assemblages or installations (as in Tracey Emin's My Bed). Such work contains recognizable things, but there is a personally detached quality to it that can make the viewer wonder just what the point is. Seeing one of Duane Hanson's hyperrealistic "sculptures" [more], for example--figures cast directly from a live model, adorned with real clothing and props--does not significantly differ from looking at a real person when one catches sight of it at a distance in the sort of busy public space in which his work is often exhibited (such as an airport passenger terminal). Because Hanson did not transform the subject matter in any distinctive way through his handling of the material, the work does not suggest anything particular about his view of reality. It offers no insight. Unlike a true work of sculpture, it is not a "re-presentation" of reality, filtered through his imagination and sensibility. It is, for all intents and purposes, a mere presentation. Consider another example, Joseph Kosuth's One and Three Chairs, which consists of a nondescript folding chair, a lifesize photograph of such a chair, and an enlarged dictionary entry on "chair." Not long ago, a retired art teacher lamented to me that she had no idea what to make of this work of so-called conceptual art, which she had just seen on a visit to the Museum of Modern Art. What, she wondered, was such a work doing in an art museum? The Oxford Dictionary of Art defines "conceptual art" as "various forms of art in which the idea for a work is considered more important than the finished product, if any." But such an invention turns the very nature of visual art on its head, ruling out the artist's role in the meaningful shaping of visual form. The role of emotion. What about the role of emotion in postmodernist work? In contrast with the modernists, who viewed art as a direct expression of emotion, postmodernists are typically detached from emotion and even reject it outright. Andy Warhol once explained that the reason why he didn't create paintings was because he didn't "love roses or bottles or anything like that enough to want to sit down and paint them lovingly and patiently"--a very revealing confession indeed. Equally revealing is what John Cage--the avant-garde "composer" who inspired many postmodernists in the visual arts--had to say on the subject: "Emotions do not interest me," he declared. "Emotions have long been known to be dangerous. You must free yourself of your likes and dislikes." The dysfunctional implications of such extreme emotional detachment, I should note, are analyzed by psychologist Louis Sass in his illuminating study Madness and Modernism. The artist's role. Since postmodernists seek to blur the very distinction between art and life, thereby denying the value of works of art as such, it is not surprising that they minimize the artist's role in the creative process. Meaningful intention is downplayed or utterly rejected. In its place, chance and accident are fully accepted as legitimate factors in the creative process. Cage, for example (notorious for his practice of composing "music" by rolling dice), actually stated: "[M]y purpose is to remove purpose." That attitude was echoed by Rauschenberg, his frequent collaborator. When a curator speculated about a purposeful intention in one of his canvases, Rauschenberg is said to have remarked: "You mean I had a direction? It's a damned good thing I didn't know that before I did the painting. When I know what I'm doing, I don't do it." The sketchbooks of another leading postmodernist, Jasper Johns, are full of such pointless notes as "Put a lot of paint & a wooden ball or other object on a board. Push to the other end of the board. Use this in a painting." And "Take a canvas. / Put a mark on it. / Put another mark on it." Notwithstanding the mindlessness of such an approach to the creation of art, the head of the prestigious Wildenstein art gallery in New York--a gallery famous for its handling of Old Master paintings--recently referred to Johns as today's "greatest living artist." Surely a sign of just how precipitously the artworld has declined from any meaningful standard! Andy Warhol, the preeminent purveyor of "Pop art," further typifies the postmodernists' dismissive attitude toward the artist's creative role. 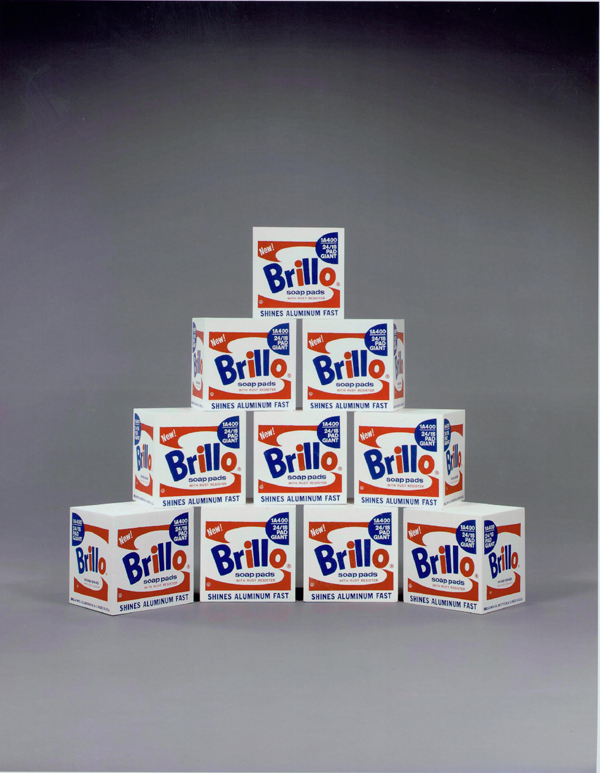 Some theorists (most notably, the philosopher-critic Arthur Danto) have attempted to read serious philosophic or sociopolitical intent into banal pieces such as his Brillo Boxes [more] or his Green Coca Cola Bottles, while others praise Pop art, in general, as "simple, direct, and immediately comprehensible." Warhol's own words, however, indicate that the emotional emptiness of his blandly mechanical and repetitive work--much of which was, in fact, mechanically produced by assistants in his studio (aptly dubbed the "Factory" by him)--was neither a quasi-philosophic reflection on the nature of art nor an ironic comment on, or critique of, consumerism but merely a direct reflection of his own disturbed psychology. "Everything is nothing," he once wrote. "The reason I'm painting this way," he told an interviewer, "is that I want to be a machine." In recent decades, postmodernists have attempted to assume a more meaningful role for themselves as "artists," by referring to social and political issues in their work (this sociopolitical focus has endeared them to advocates of Visual Culture Studies in art education). Yet they continue to work in anti-art genres such as "installation" and "conceptual art" --which, as I indicated above, had been invented in the 1960s with the express intention of subverting art. They choose these genres not because they consider them to be the most effective means to convey whatever ideas they may have but because they lack the talent and skill to paint or sculpt. Damien Hirst, one of the postmodernist artworld's superstars, for example, confided in a televised interview that he would really like to be able to paint--that is, to "represent the three-dimensional world on a two-dimensional surface"--but had "tried it and . . . couldn't do it." When faced with the void of a blank canvas, he further explained, "I don't know what the hell to do." An entire generation of would-be artists like him have graduated from art schools here and abroad with no real art instruction, and they fill museums and galleries with their videos, photography, and installation pieces. Typical of this vein of postmodernism is an installation by a Rhode Island high school student, who won a silver key for the piece in the state's Scholastic Art competition--provoking a small public furor when a local citizen objected to the work. 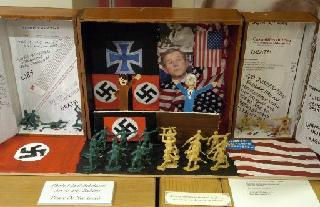 The piece is a diorama-like "assemblage" that simply juxtaposes quotes from Adolf Hitler with statements by President George W. Bush; Nazi swastikas with American flags; and sand-colored toy soldiers (representing Americans) with olive-drab figures (representing Nazis). It is evident that the student has done nothing to shape the material, and any other arrangement of appropriated images and texts might have just as easily conveyed his crude political intent--which was "to point out certain similarities between the U.S.-led war in Iraq and the German blitzkrieg," as he told the Providence Journal. As in all "conceptual art," no skill was involved--only a simple-minded (and historically ill-informed) idea. To the citizen who complained about it, it is merely a bit of offensive political propaganda. To the teachers who awarded it a silver key, however, it qualifies as art. The view of art articulated by Ayn Rand and analyzed in detail in What Art Is presents a sane alternative to both modernism and postmodernism. What follows below is a cursory summary of that view. The relationship between art and life. On the crucial question of the connection between art and life, Rand's theory holds (in sharp contrast with modernism and postmodernism) that painting and sculpture, like the other major art forms, serve an important psychological function--one that is intimately associated with our life as conscious beings. Through carefully wrought images informed by the artist's knowledge, experience, and feelings, they embody values--a view of life--in perceptually and emotionally compelling form. In so doing, they serve to make us more aware of what we think and how we feel about the world and our life in it (as well as about the alternative worlds we imagine). They bring those ideas and values more fully to consciousness. In visual art, the means employed to accomplish this is the selective re-creation of visible reality. Form/style vs. subject matter/content. Since the purpose of each work of art is to embody meaning, through the eyes of the artist, form and style are important--not in themselves, but because they affect the work's ultimate significance. Meaning, or content, is the product of subject matter, form, and style. Though the subject matter of Picasso's Weeping Woman, say, and Rubens's drawing of a Young Woman (Study for the Head of St. Apollonia), for example--or Picasso's First Steps and Cecilia Beaux's Ernesta (Child with Nurse)--is similar, the stylistic disparity of these images yields vastly different content, and suggests much about the values and sensibility of each artist. And each will no doubt elicit very different responses on the part of a viewer, according to his own values and sense of life. The role of emotion. I have already hinted at the role of emotion in this alternative view of art. Contrary to postmodernist theory, emotion has always been deemed a crucial factor in both the creation of art and the response to it. But equally contrary to modernist notions, it cannot be expressed directly in abstract form. It must be suggested through objective forms. 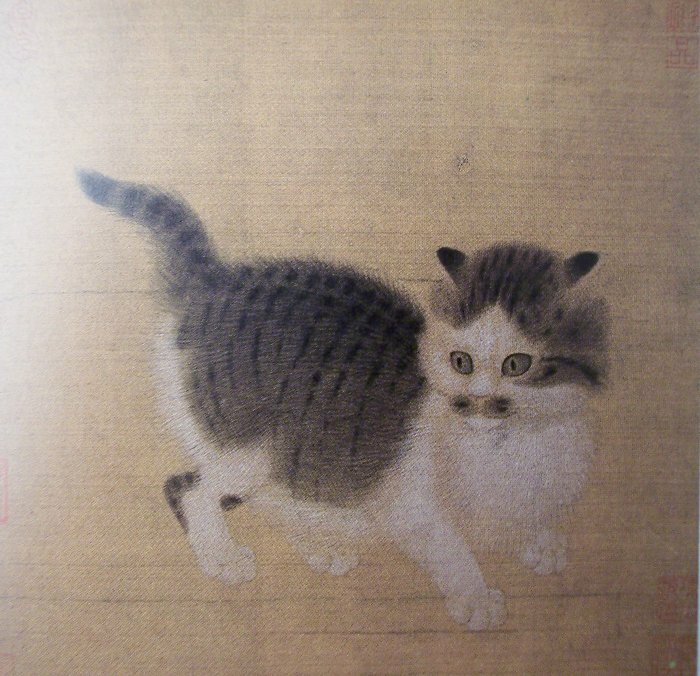 Centuries ago Chinese poets and sages wisely spoke, for example, of the need to "embed feelings in an object." Every genuine work of art represents something the artist cared about enough to have gone to the considerable trouble of representing it. Whether a direct interpretation of observed nature, or an imaginary re-creation of reality, every true work of art reflects what its maker regarded as worth remembering or reflecting upon. 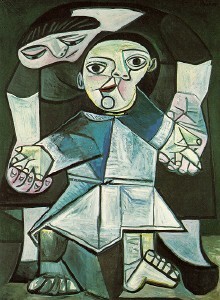 And each viewer responds emotionally to what is represented according to the values and life view he holds. 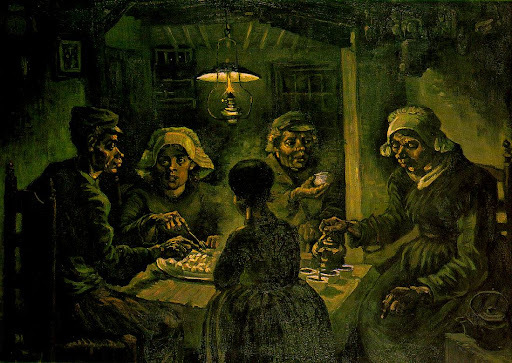 I have tried to emphasize that those people, eating their potatoes in the lamplight, have dug the earth with those very hands they put in the dish, and so it speaks of manual labor, and how they have honestly earned their food. / I have wanted to give the impression of a way of life quite different from [ours]. Painting peasant life is a serious thing, and I should reproach myself if I did not try to make pictures which will rouse serious thoughts in those who think seriously about art and life. 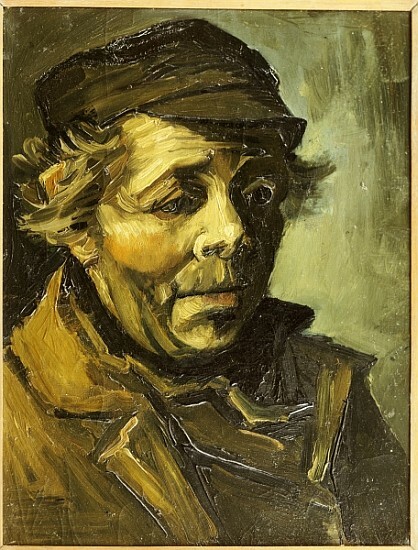 He further explained that, though the entire painting would be completed in a relatively short time and largely from memory, "it [had] taken a whole winter of painting studies of heads [more] and hands." Painting is not only skill, though likeness cannot be rendered without skill. . . . [T]o express an idea or to represent an object properly, it must be turned over and over again in the mind, until it unites with the soul. The greatest artists, therefore, have not only developed keen powers of observation, they have also possessed great sensitivity, and have so honed their skill at visual representation that they are able to embody their sense of life in their work. It is because of their capacity to think and feel intensely, and to create images that give expression to their thoughts and feelings, that their work is of value to others. Their subject matter may at times appear quite ordinary, but their treatment of the subject never is. 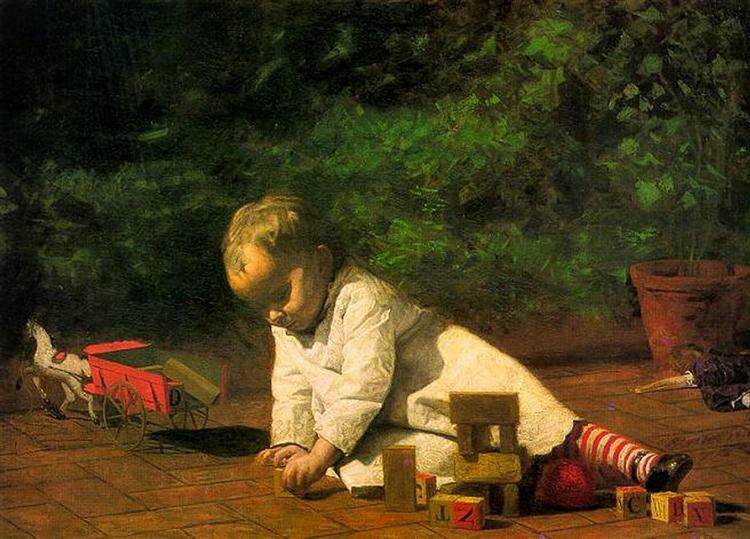 In works such as Vermeer's View of Delft, Thomas Eakins's painting of a Baby at Play, a kitchen Still Life by Chardin, or a twelfth-century Chinese painting of a Kitten, even ordinary things gain a heightened reality that endows them with enhanced value and significance. Since I originally prepared these remarks for an audience of art teachers, let me add a word about some implications the alternative view of art I have outlined would have for the classroom, the studio, and the museum. To begin with, I would echo Jacques Barzun in urging teachers and others to use common sense (as well as urge young people to use theirs) on the question of what constitutes a work of art. If artworld professionals like the head of the Wildenstein gallery can't recognize that what Jasper Johns and other postmodernists do has no relationship to what the Old Masters did, then they are the real philistines and there is no reason to follow their example. 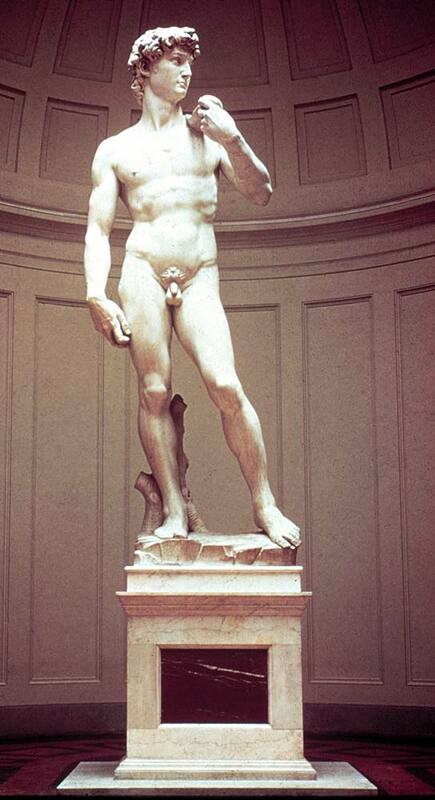 The time is long overdue to declare that the artworld emperors have no clothes. This admonition includes re-considering the status of abstract art. If by the term "art"--as contrasted with "decorative art"--we mean work that conveys meaning through visual form, abstract work (however serious or sincere the intentions of some of its makers) belongs, at best, in the latter category and, at worst, in neither. Moreover, I would advise against attempting to teach students or museum visitors how to "comprehend" work that is, by any objective standard, incomprehensible. In the art classroom, I would banish collage and "installation" projects, photography, and video, and would focus instead on instruction and practice in drawing and on the study and appreciation of high-quality works of painting and sculpture from all periods and cultures, including our own. Finally, I would suggest that in teaching about a work of art, instructors begin by eliciting students' emotional response to the work, before proceeding to the issue of meaning and how it is conveyed. For if all one does is intellectualize about art, one has not really "gotten it," and one might just as well be doing something else.